Image Size: 19-1/2" x 12-1/2"
The Mitsubishi Zero was one of the best known Japanese combat aircraft of the Second World War. Used extensively as a suicide aircraft towards the end of the Second World War as a desperate attempt to turn the war in their favour, many were shot down. 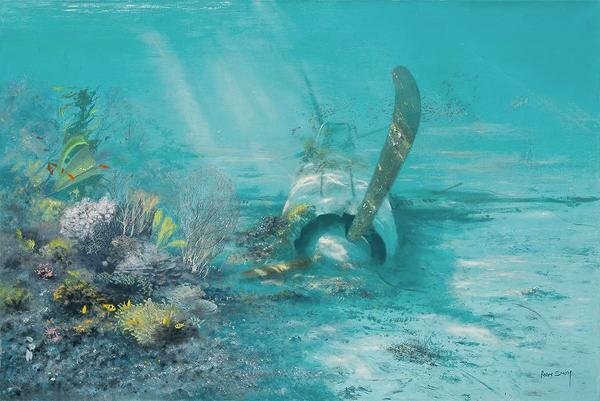 The image depicts such an aircraft after a ditch in the shallow waters just off the Solomon Islands in the South Pacific. Ditched aircraft such as this one offer a wonderful habitat for sub aqua wildlife and are very soon taken over by all sorts of beautiful coral and strange looking fish. Aircraft shells are in fact intentionally lowered down into the warm waters at suitable locations for the very purposes of wildlife colonisation. One thing that attracts me to this sort of composition is the wonderful shade of blue that is found at that depth. Just 30 feet down it is another world!